School is back in session, and that means children are eating more meals away from home. The school year not only means busier schedules for kids, but for parents too. Parents are looking for quick and convenient lunch options for their children. Unfortunately, this often leads to less than healthy choices including chips or cookies. Packing healthy snacks and lunches will help your children power through the day, contribute to their success and help them develop lifelong healthy habits. Studies have shown that nutrition affects behavior, learning ability and memory of children.­­­­­­­­­­­­­ A study published in Obesity discovered that fifth graders who ate more fast foods performed worse on math and reading assessments. Additionally, poor nutrition can lead to stomach aches, headaches and increased susceptibility to illnesses, which are disruptive to a day of fun and learning at school. However, amongst busy schedules, purchasing and packing healthy lunches for your children can be a daunting task. 1. Start by looking at beverages. Are your children drinking sugar-sweetened beverages? If so, you could be setting your child up for a sugar rush, followed by a crash in energy later. Skip the sodas and sugary juice, and send a reusable water bottle instead. This saves you money and helps them get the hydration their bodies need and skip the empty calories that they don’t. Other good beverage options are low-fat milk and 100 percent fruit juice – however, limit juice to half cup servings. 2. Be aware of serving sizes. Children have smaller stomachs, and therefore need to eat smaller amounts more regularly. Make sure you are sending an appropriately portioned meal and a snack to get them through the day. 3. Let your creativity flow. Create healthy lunch box options that have an additional flavor of fun included. This will be especially helpful if you’re switching from salty, sugary snacks that they might be sad to see go. Below are examples of a fun, healthy lunch box options for your kids at any stage. 4. Think outside of the box (or package). A common side item in a lunch box is a bag of chips. While convenient, packaged and processed foods are generally higher in sodium, calories and fat. See what other nutrient dense sides you can swap for the chips. Air popped popcorn, edamame, fresh fruit, veggies and homemade ranch dip are more nutritious and popular options. 5. Go against the (usual) grain. Whole wheat tortillas, pitas, crackers and pasta can be a healthy and fun alternative to white bread. By switching to more complex carbs, you’ll help increase satiety, and power your child with steady energy until the final bell rings. 6. The leaner the better. Make sure to include a lean protein source with lunch to promote a steady energy release. Protein sources like chicken, turkey, fish, peanut butter, eggs and beans are good options to try. 7. Practice what you preach. Remember that your children are always watching you. So try new things and pack your lunch along with theirs and get them involved. 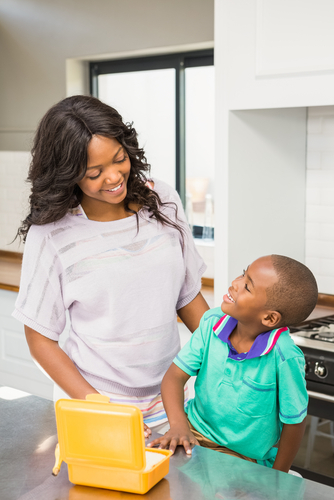 When your children get to make a meal with you, they’re not just filling a lunch box but learning healthy habits. They’ll not only be proud of their creation and be more likely to eat it, but they’ll also begin learning lifelong skills that will help them become healthier adults. 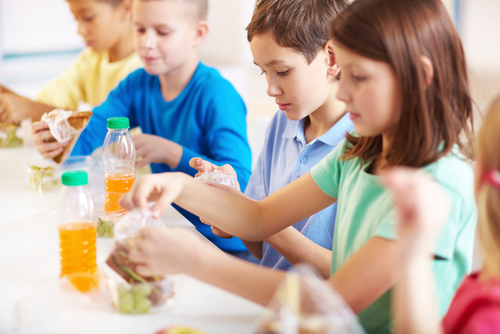 Planning and preparing healthy school lunches takes time, but by including your children in the process, you’ll teach them habits that they’ll maintain throughout their life. Don’t forget to have conversations with your children about nutrition and teach them how the right food fuels their body.